Enik Rising: Does primary turnout tell us anything about the general election? 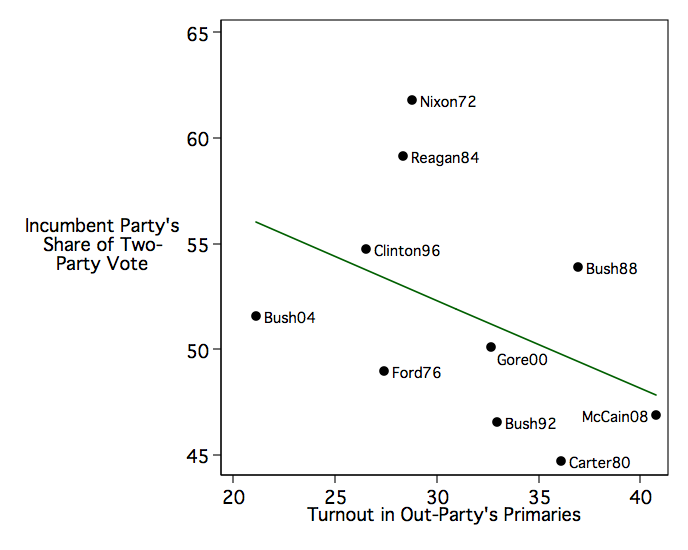 Does primary turnout tell us anything about the general election? Sean Trende had a nice piece a few days ago pondering the question of whether the relatively low turnout in Republican primary contests so far (compared to 2008) portends ill for the Republicans in November. Does this mean that Republicans are unenthusiastic this year and won't turn out for their nominee? Just to be clear about what this means, in 1996, only about 26.5% of self-identified Republicans participated in the primaries, and the Democratic incumbent (Clinton) got about 55% of the two-party vote in November. Similarly, in 2008, turnout was at a record high in Democratic primaries, and the incumbent party's candidate (McCain) did poorly in November. 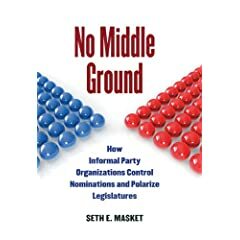 The results above suggest a negative correlation, implying that lower participation in out-party primaries is associated with a higher vote share for the incumbent party's candidate. For this year, that would mean that if Republican primaries are really suffering from low turnout, that would favor Obama. The relationship shown above is not statistically significant and is further washed away when one controls for economic growth. The relationship shown above is based on a small number of cases (from 1972 on). 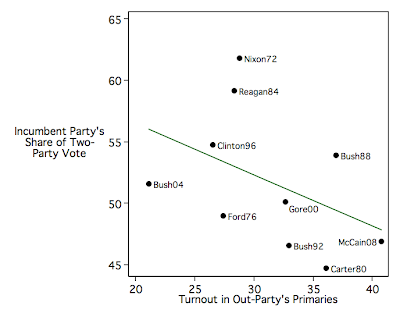 The measurement of turnout in primaries is imperfect. I'm using an estimate of all those who identified with the party in my denominator, but different state party rules strongly affect who gets to turn out. (e.g. : Democratic leaners, whom I include, might have a harder time participating in a closed primary than in an open one.) I'm open to better data if anyone has any. Interesting work. One other thing I think you would want to control for is how many weeks the primary goes on for. Like I said, if Obama had put Hillary away in New Hampshire, or if the primary/caucus order had been different and Hillary had followed Super Tuesday with big wins in PA, OH, WV, KY, etc., I don't think turnout would have been as high overall. Of course, this is tricky, because you have to figure out a way to account for people like Huckabee who kept competing well after everyone knew that McCain was the nominee . . . Thanks, Sean. I think you're right about the competitiveness and duration of the primary contests. I doubt there's a direct causal relationship between primary turnout and November results. If the economy is weak, that may encourage more high quality candidates to enter the out-party primaries, which could expand competition and lengthen the race, increasing turnout. I don't have a sense yet of where 2012 will fit in. If Newt drops out before Super Tuesday, turnout will take a hit, but I can't believe that makes Obama's reelection easier.